PETALING JAYA: Credit for the purchase of commercial properties in March grew by 22.7% year-on-year, raising concerns in some quarters of a potential asset bubble. This loan growth in the non-residential sector, which includes industrial and commercial properties, was the highest followed by credit growth for the construction sector at 19.2%. Meanwhile, loan growth for purchase of residential properties in March had somewhat moderated to 13.9% year-on-year. Illustrating the rapid pace of loan growth, the total stock of loans in the non-residential sector has grown from RM70bil in June 2009 to RM116bil currently, or 66%. However, a note of caution is that projections of strong demand usually lead to overbuilding, and eventually an oversupply situation. The presence of too many listed property and construction firms also places pressure on the need to grow profits. “The non-residential sector has grown significantly but the bulk in value is still in residential which comprised 28% of total loans in March,'' said Low Yee Huap, head of research, Hong Leong Investment Bank. Over the past few years, a low interest-rate environment and accumulation of liquidity has encouraged the buying of shophouses and offices, while some high-rise buildings come with commercial titles. Recently, there has also been a lot of non-residential launches. Moreover, the purchase of non-residential properties is not subject to the loan-to-value cap. “It's become a trend now for commercial launches, with smaller commercial units and sohos being built for affordability. “It is more a matter of market forces and changing of customer preferences,'' said Chan Ken Yew, associate director of Kenanga Investment Bank Bhd and head of its research division. Popular landmark: The Sultan Salahuddin Abdul Aziz Shah mosque. 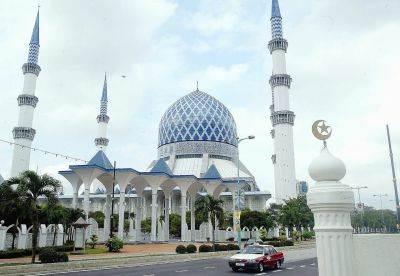 SECTION 5 in Shah Alam is set to be turned into an “Islamic City” after the final plans have been approved by the Shah Alam City Council (MBSA) and Selangor government. The “Islamic City” includes a 20ha area surrounding the iconic Sultan Salahuddin Abdul Aziz Shah mosque and Shah Alam Lake Gardens. Five consultants presented their designs for the development of an “Islamic City” at a workshop held at The Saujana Hotel Kuala Lumpur recently. Representatives from Ikhtisas Planner, AJC Planning Consultants, IZM Planning Consult, DPZ Asia and Prof Emeritus Dr Ismawi Zen, who is a lecturer in the Architecture and Environmental Design, presented their designs and how each could use the area after taking into account the lake, mosque and courts, nearby. Selangor Mentri Besar Tan Sri Abdul Khalid Ibrahim said he was sceptical when the idea was first mooted by Shah Alam mayor Datuk Mohd Jaafar Mohd Atan. However, he said the idea made sense and it was now time to turn those dreams into reality. He added that the state together with MBSA would also have to come up with ways of preventing traffic congestion with the influx of cars into the city. Khalid also wanted the “Islamic City” to be an ideal location for businesses, educational institutions and other activities. “We have to look at all angles from marketing Shah Alam to designing the area,” he said. He added that Islamic elements and traditions should also take precedence in one’s design. He said the design and architecture should also be appropriate. The cost of the project has yet to be determined but it would be between RM2bil and RM3bil as it covered a large area. When completed, Khalid said it would be a new breather for Shah Alam and could further boost the city’s potential in business, tourism and art. He said he wanted to look at all designs and recommendations before deciding to go ahead with the project at the end of the year but declined to comment on when the project would be completed. The best option so far for the bumiputra developer will see UDA take on a lot of the risk Everbright is willing to shoulder. UDA. together with the bumiputra developer, must secure the funding for developing the project, which will lower the returns it will obtain. Nur Jazlan said it would not be easier to REIT out at a later date if the assets were jumbled up with different developers. Emas Kiara Industries Bhd (EKIB)'s wholly-owned subsidiary, Noblecorp Sdn Bhd, has acquired land in Kulai, Johor, from Creative City Development Sdn Bhd for RM5.258 million. In a filing to Bursa Malaysia, EKIB said the property outlook in Johor was expected to be positive taking into consideration the advanced stage of completion of major infrastructure works. "Major projects in Iskandar Malaysia are coming on this year and the investment prospects enhanced by the Economic Transformation Programme would also contribute to the overall positive outlook," it added.